When the winter has finally lifted and the sun is shining unabashedly, it is time to check your home for any potential damages that may have happened throughout the cold months. 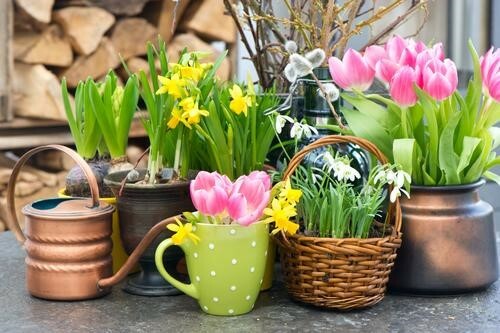 Here is a list of things to check throughout your home before heading outside this spring. Your roof is your greatest protection against the elements of winter, and can take quite a beating. Check your roof for loose shingles or torn lining. Ensuring that your roof is in great condition now, will help you be prepared for the upcoming springtime rains. The ever-changing conditions throughout winter can fill your gutters with all sorts of debris, rendering it useless by the end of the season. Be sure to check it for any damages (leaks) from the excess weight of debris, and then clear it out completely. The best gutter is one that is able to redirect water away from your home, so you want to make sure it is able to do so! Though this doesn’t immediately come to mind when we think about spring-cleaning it is an equally important step as the others on this list. Some lint escapes past the initial lint screen and can get clogged in the dryer vent, forcing your dryer to work harder. This can be costly for your electricity bill and damaging to the machine. Inspect it carefully and remove the lint as best you can. Once it’s springtime, you can relish in the fresh air outside by opening your windows and welcoming that air into your home. Before you do so, do a quick wipe down with a rag and soapy water to remove the buildup from the winter. Check for tears and holes and patch them up to keep the bugs out. Clean Outside Decks, Fences, etc. A lot can build up on decks and fences in the cold months when you stay inside and this is the perfect time to fix that. If you have a pressure washer, then you can quickly scrape away the layers of gunk. If you do not own a pressure washer, then you can rent one from your local hardware store and be done with the chore in a single day. The winter can be rough on the exterior paint of your home. The moisture can cause it to peel and the winds and cause it to crack. Though the paint makes your house look nice, it also serves as a protective barrier, so check for cracks and peeling and repair as needed. While you’re fixing up the rest of your house, it is the perfect time to also check the batteries in all of your smoke detectors. This is a matter of life and death and should be checked regularly. The elements of winter can be harsh and can break down the caulking and stripping that seals your doors and windows. Carefully check each door and window and be sure to repair any damages. This will help protect you in the next winter and also save you money during the summer when you’re running your air conditioner! Now that the ground is clear of the winter snow or rain, check for cracks in the concrete. If left untreated, the cracks can spread and ultimately dismantle your concrete surface. These are relatively easy to fix and are best addressed during the springtime so that you have all year to monitor it. After months of use, the chimney can get quite dirty. Check the flue and examine the exterior for any damages that may have occurred. It is helpful to have it professionally cleaned every few years and to fix any damages. Spring-cleaning is an important ritual each year, and it is also a great opportunity to take care of your home. With these basic steps, your house will be at it’s best for the rest of the year and will be ready for the next winter with no problems. If your door needs a little TLC this spring, we offer refinishing services. Contact us today to see how we can help!